Public transport, city planning and accessibility were all on the agenda during discussions between local residents and political candidates, at a community forum in the lead up to the March 19th Brisbane City Council elections. The event took place at the monthly Carindale and Eastern Suburbs Community Forum on Wednesday evening. Councillor Adrian Schrinner (LNP – Chandler), Kerryn Loose Jones (ALP – Doboy) and David Nelson (Greens – Doboy) introduced themselves, discussed their campaigns and fielded questions from the group of local residents. Following the candidates’ introductions and question time, Senior Sergeant Jim Whitehead held a presentation discussing Search and Rescue operations in Australia. Forum host Glenn Millar of RE/MAX United Vision mentioned that past political discussions at the community forums had been amongst the most civilised and relaxed public exchanges between politicians, a sentiment which held true for a majority of the proceedings. 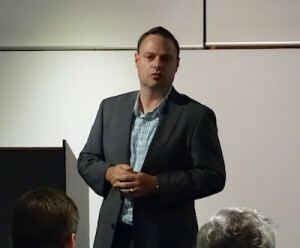 David Nelson, Greens candidate for Doboy Ward, a Canadian expat with degrees in engineering and economics, cited the need for the “right kind of development” in the south-eastern suburbs, which are some of the lower lying areas in Brisbane, encompassing sections of Bulimba and Tingalpa Creeks. 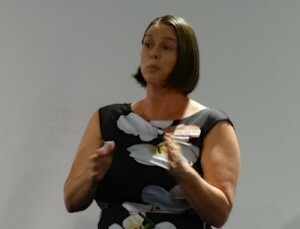 Labor candidate for Doboy, Kerryn Loose Jones, championed a need for change in Brisbane’s city plan and a stricter adherence to it by developers, citing the example of the clogged narrow streets around Carina’s townhouse developments, where many projects have not allowed for enough residential car spaces. “It’s particularly bad around the Clem Jones Centre,” said Loose Jones, who sprung into politics off the back of her unrelenting efforts to save the Whites Hill State College ovals from development. 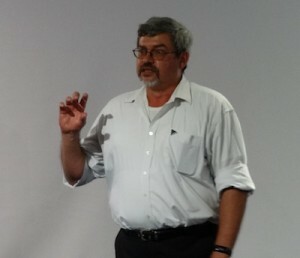 Adrian Schrinner of the Liberal National Party, Chandler’s councillor since 2005, expressed excitement that both major political parties have flagged public transport and clearing congestion as the most important issues for Brisbane during the election period, as well as highlighting the importance of job growth and protecting the local environment. The Federal Government’s proposal of a freight rail line running parallel to the Gateway was of particular concern to Cr Schrinner, who mentioned that land set aside for nature reserves east of the Motorway purchased by the Brisbane City Council could be under threat. Some residents questioned the Council’s ability to block developers pushing through projects where many complaints had been made by residents, and to enforce agreements on certain aspects of construction. As well as the Carina congestion, ‘The Residences’ townhouse development at 370 Pine Mountain Rd Carindale drew the ire of one frustrated resident, who claimed that over 90 complaints had been made to the council prior to the development, mostly by the residents of the surrounding Flame Tree Crescent, none of which were adequately addressed. The clearing of hundreds of trees from the property was also heavily criticised. Cr Schrinner explained that complaints must be made on legitimate planning grounds, rather than general opposition to the project, to be taken on board. The Councillor for Chandler mentioned that adequate green space had been reclaimed in other areas to compensate for the removal of fauna on the site. He also stressed that the Council must work within the State Government’s framework for altering planning applications, which can complicate the process and make it difficult for the Council to stand up to developers. “I think the message here is that residents are fed up [with the handling of developments],” said Glenn Millar after much heated discussion about the Pine Mountain Rd project, where a number of residents called for better communication and change. Senior Sergeant Jim Whitehead’s presentation on search and rescue in Australia was a change from the usual vein of speakers at the forum, discussing how Australia has the second largest maritime search and rescue area in the world behind South Africa, and how thousands of successful rescues of people on land or at sea were made over the 2013/14 financial year. Cr Schrinner may have to consider employing Senior Sergeant Whitehead for a search and rescue operation for his campaign signs, of which he claims 47 have disappeared in the past two weeks. The Carindale & Eastern Suburbs Community Forum is held at 7pm on the last Wednesday of every month at the Pacific Golf Club, 430 Pine Mountain Rd Carindale. Tea and coffee is provided, as is the opportunity for members of the community to keep up to date with local issues and events.